Dracena Marganita or Madagascar dragon tree, also called red-edge dracaena Marganita, is one of the most popular houseplants around. 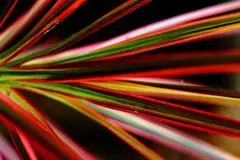 It bears narrow green leaves banded in red or pink on top of slender stems. Its upright habit makes Madagascar dragon tree a useful houseplant to grow against a blank wall, to provide privacy in front of a window, or at the end of a sofa or chair as it ages and becomes tree like. When it's young, Madagascar dragon tree adds beautiful texture to tabletops, desks, and other surfaces. 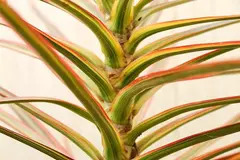 Care Instructions Dracena Marganita or Madagascar dragon tree does best in a bright spot, but will tolerate low-light conditions so you can grow it practically anywhere. In such low-light spots, you may see it lose the red or pink coloring on leaf edges and it will grow more slowly (and also require less water). Water it when the top inch or so of the soil starts to dry. The plant holds up to dry conditions fairly well, so you don't have to worry about it dying if you miss a watering or two. If your Madagascar dragon tree develops brown leaf tips, the most common cause is low humidity. 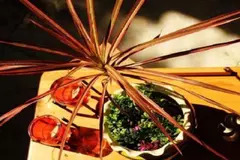 Add more moisture to the air by grouping it near other houseplants, moving it to a humid room such as bathroom, or setting your Madagascar dragon tree on a large tray filled with pebbles and water (so the bottom of the pot is on the pebbles, above the water line). Fertilize Madagascar dragon tree once or twice a year at minimum with a houseplant fertilizer. If you want your plant to grow faster, you can feed it more frequently. If you wish to prune your Madagascar dragon tree, you can cut the top off; it will sprout new branches. If you pot the part you cut off in moist potting mix, it may root and grow into another plant. This wonderful houseplant is not recommended for human or animal consumption.